Where would you expect to find such a gaudy monument to consumerism? Las Vegas? Nope. Times Square? Try again. The first ever KISS Coffeee House is located in my native South Carolina at Myrtle Beach’s Broadway at the Beach. Myrtle Beach is one of the southeast’s fastest growing tourist destinations due to its miles of sandy beaches and family friendly nature. Broadway at the Beach is a large, almost sprawling, conglomerate of up scale shops, clubs, and eating establishments. Many of the businesses there are meant to be garish and touristy, but the KISS Coffee House takes the cake. Even though the store front stands out above all others the inside is small and intimate. At first I thought this would be a problem, but, in all actuality, this is not a museum. It’s not a KISS bar or club. It’s not even a KISS restaurant. It’s a KISS Coffee House, and the location is perfect for popping in to get a Frozen Rockuccino and continuing to walk around and enjoy the other shops, after looking at all the cool stuff on the walls anyway. This event was unique in that KISS fans were able to line up outside the coffee house and get to meet Paul and Gene once the press conference was over. Over the course of a few hours the line grew from a couple hundred feet to wrapping around most of the length of that areas parking lot. There had to be a couple thousand people waiting, some since early that morning. Meanwhile, the KISS tribute band KISS Army was putting on a show in front of the Hard Rock Cafe for all the fans that couldn’t bear to wait in line. 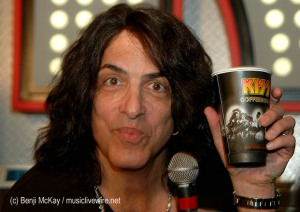 It was rumored that Paul and Gene were going to join KISS Army on stage at the end of their show for an announcement, but Paul and Gene remained in the coffee house taking pictures and signing things for their fans. They stayed nearly an hour and half longer than anyone expected (probably even their manager Doc McGhee) making sure that their fans knew despite all of their success and current ventures KISS is still all about the fans that got them to where they are today.